With all the conflicting economic indicators coming out of China, it is difficult to gauge whether economic growth has stabilized after recent declines. One indicator that clearly points to a potential ongoing slowdown in construction and manufacturing is the weakness in iron ore and steel prices. The Shanghai steel rebar futures have hit a new low this morning. In fact the situation has gotten so dire that a number of Chinese steel mills have defaulted on their purchase agreements of iron ore. Their output product has rapidly declined in price, collapsing margins to unsustainable levels, forcing the mills to walk away from their contracts. Reuters: - Chinese mills, the world's biggest iron ore buyers, have either cancelled or deferred shipments of up to 4 million tonnes this month after [steel prices] tumbled to their lowest in more than 2-1/2 years, the latest evidence of a slowdown in the world's top steel market. Shanghai steel rebar futures, down nearly 14 percent this year, hit a record low of 3,555 yuan ($560) a tonne on Wednesday. It closed about 1 percent lower at 3,557 yuan, its eighth daily loss in a row. "I don't feel good. 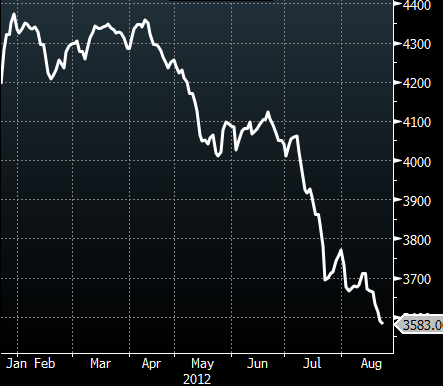 I don't think iron ore prices will bottom out soon. As long as steel mills don't aggressively cut production, the market will not see a balance," said an iron ore trader in Shanghai. The falling "downstream" demand (steel) is forcing iron ore ("upstream") prices to decline as well. 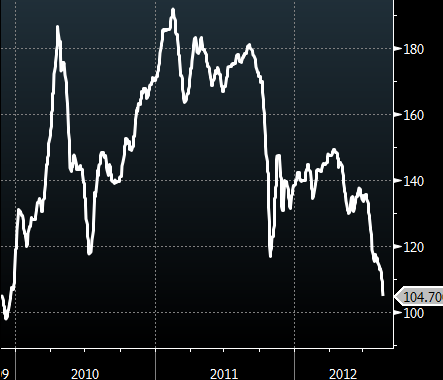 Imported iron ore has hit a new post-2009 low. Reuters: - Iron ore with 62 percent iron content, the industry benchmark, fell 2.7 percent to $106.40 a tonne on Tuesday, its weakest since Dec. 16, 2009, based on data from the Steel Index. Some potential buyers are so bearish about the outlook for prices that they seek discounts of between $10-$15 from index-based prices. "It is very worrying. They are asking for far bigger reduction in prices when they try to inquire for material," said a Hong Kong-based trader. Some economists continue to argue that China's growth will continue unabated. When one visits China, particularly in some of the larger cities, it certainly feels as though the economy is booming. Construction is everywhere, factories are humming, and everyone is shopping. But these raw materials prices are telling us a different story - a story of a significant slowdown in industrial demand. And a number of Australian mining firms, who are the first to feel the pinch, would certainly agree.